Why Use A Sleep Hypnosis Audio? This Insomnia No More Sleep Hypnosis Audio MP3 will put you to sleep every night easily and effortlessly. If you have trouble falling asleep or staying asleep through the night, hypnosis can help relieve the stress, restless mind, and agitated feelings associated with insomnia. The most wonderful part of using the Insomnia No More Hypnosis MP3 to relieve insomnia is that it does not create a dependence on drugs to get to sleep. Using drugs instead of hypnosis to get to sleep and stay asleep through the night has other drawbacks beyond dependency. Many prescription drugs have side effects that can be dangerous. Some drugs if taken too early can cause sleepiness while driving. Others can make it difficult to get up in the morning, especially if taken too late or when you can’t get a full 8 hours of sleep. With hypnosis, the sleep is naturally induced so that the body goes through the normal sleep cycles. Sleep cycles are vital to feeling rested upon waking in the morning. A specific number of hours of R.E.M. sleep – the Rapid Eye Movement stage that is the deep, restful sleep stage is important to allowing the body and mind to rejuvenate itself. As morning approaches and a certain number of hours have passed, the body gradually awakens to lighter levels of sleep. When we are able awaken on our own, we will feel the most rested. This comes from getting the right number of hours of sleep and the right type of sleep. It is nearly impossible for sleeping medication to recreate or allow the body to get enough R.E.M. sleep without too much. Hypnosis doesn’t create chemical reactions or dependency. It naturally relaxes the body and mind so that it can go into the proper stages of sleep at the right time. After three weeks of using a self hypnosis program to fall asleep, your mind and body will be trained to do it on its own. It will become as routine as brushing your teeth at night. Clinical Hypnotherapist Steve G. Jones has created Insomnia No More Hypnosis MP3 session to guide listeners into the level of relaxation that invites sleep. This type of entry into a sleep mode makes it possible to enter the stages of sleep naturally and awaken refreshed in the morning. Sleep EASILY, EFFORTLESSLY, and NATURALLY so that you can ENJOY YOUR LIFE and get the most out of it !!!! Steve G. Jones, Ed.D., Clinical Hypnotherapist, charges $1,500 for a custom recording and $25,000 for a one-hour private hypnotherapy session at his office. But you can get all the benefits for this low price. 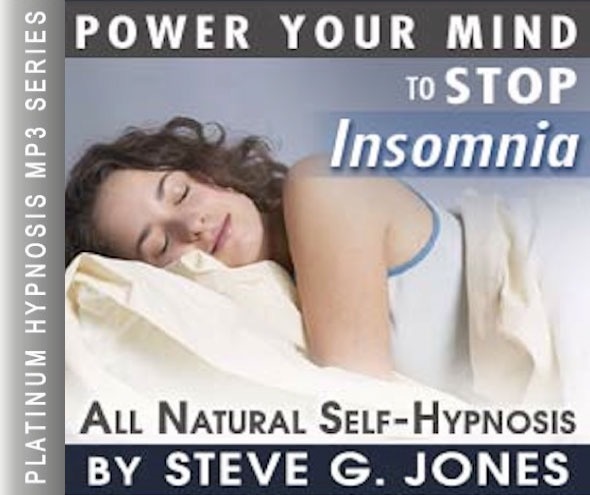 Simply listen to the Insomnia No More Hypnosis MP3 Sleep Hypnosis Audio every night as you go to bed for three weeks and feel the changes happening in your life. You will feel more empowered, more in touch with your true self, and you will truly know that your goals are within your reach. It is estimated that between 30-50% of people are affected by insomnia. Insomnia is the inability to fall asleep or the inability to stay asleep. The most common cause of insomnia is stress. However, there are medical conditions that can cause insomnia. If you suffer from pain, COPD (Chronic Obstructive Pulmonary Disease), Alzheimer’s Disease, or congestive heart failure, then you should seek the advice of your doctor. Other triggers of insomnia include medications, caffeine, alcohol, and a disruptive bed partner. You can do certain things to insure a good night sleep. You can try to incorporate regular exercise into your daily routine. It is important to make sure there aren’t any noises or lights that keep you from falling asleep or staying asleep. You also want to make sure that you do not eat or drink too much right before trying to fall asleep. And each night you will be at ease and relaxed. You’ll feel relaxed and calm knowing that every day is another adventure even though some days will have problems and things we don’t like. Every day will be an adventure, starting now. As you go to bed every night you will be calm and at ease. Your mind and your body will be calm, tranquil, and relaxed. You will be able to sleep calmly, at peace, able to sleep the way you did when you were a baby, so calm, so relaxed, so completely at peace. You will sleep so well. You’ll be able to sleep soundly, knowing in the back of your mind that day by day, you’re beginning to live more fully, more deeply. As time goes on you will live with more and more wisdom and you’ll let yourself sleep the way a baby does, when a baby feels good and very secure. You’ll sleep very well and very calmly and when you wake up in the morning, you’ll be fully rested, very refreshed and at peace. Insomnia is the inability to fall asleep or stay asleep and is often a symptom, not a diagnosis. Approximately 20% of the United States population suffers from insomnia on a regular basis. So, you can see that you are not alone, but it is important that you seek help. Hypnotherapy is a great tool to use to help with your insomnia. This Insomnia No More Hypnosis MP3 recording will target your subconscious mind which is in charge of your ability to sleep. Your subconscious mind will receive powerful suggestions to fall asleep quickly and stay asleep throughout the night. Hypnosis is a natural form of treatment. You do not have to depend on sleep medication. Hypnotherapy will allow you to get the right amount of sleep for your body, without interruptions. Hypnosis gives you the ability to be in control of your sleep. There is nothing worse than laying in bed, not being able to sleep when every part of your body and mind is telling you that you are tired. You do not have to live this way any more. You can get rid of insomnia once and for all with the help of self-hypnosis. We suggest that you listen to the Insomnia No More recording for 21 nights in a row when you go to bed at night. You will soon start to see dramatic changes in your sleeping ability! Insomnia can have a negative impact on various aspects of your life so it is very important that you get the sleep that your mind and body needs. Not getting enough sleep can impact your relationship with others, your job, energy levels, how you eat, and many other areas. I want to encourage you to get your sleep patterns under control with hypnosis. It is a natural way to overcome insomnia and get better sleep. Hypnosis has also been shown to be effective in the treatment of sleep disorders. In one study, 27 patients suffering from various sleep disorders, such as sleepwalking and night terrors, were taught self-hypnosis techniques that they could practice at home. This study found that 74% of these patients described their disorder as very much improved after practicing self-hypnosis. These results were consistent when researchers followed up on these patients both at six months and over two years after the study was conducted (Hurwitz, T.D., et.al., 1991). Hurwitz, T. D., Mahowald, M. W., Schenck, C. H., & Schluter, J. L. (1991). A retrospective outcome study and review of hypnosis as treatment of adults with sleepwalking and sleep terror. Journal of Nervous and Mental Disease. Huffington PostInsomniacs and light sleepers alike might benefit from hypnosis to coax them into a deep sleep, suggests a new study published in the journal Sleep. Researchers from the University of Zurich and Fribourg concluded that hypnosis can increase the quality of sleep, eliminating the need for medications the effects of which have long been questioned by the medical community. “It opens up new, promising opportunities for improving the quality of sleep without drugs,” says biopsychologist Björn Rasch, who headed the study at the Psychological Institute of the University of Zurich in conjunction with the Sleep and Learning project.